This feature was originally published in the September 2013 Equinox issue of The Planetary Report magazine, and only available for current members of the Planetary Society. The following is a brief sample. You can read the full article here. When Curiosity roared into space in 2011, it carried with it a material so potent that the President of the United States had to approve the launch. This material, plutonium-238 (Pu-238), is used to generate power from a process of radioactive decay, and though it has been essential to nearly 30 missions in NASA's history, its future is in doubt. The United States hasn't generated Pu-238 since 1988. Existing supplies are nearly exhausted. But after years of effort by hundreds of individuals throughout the government, the United States is on the cusp of producing Pu-238 again. It's a complex, expansive program requiring intricate coordination among multiple federal agencies, Congress, and the White House. It nearly did not survive its early political and budgetary battles. And though challenges lie ahead, NASA has quietly achieved its most important policy victory in decades. The Department of Energy depends on three different national laboratories to create, store, and assemble radioisotope power sources for NASA. 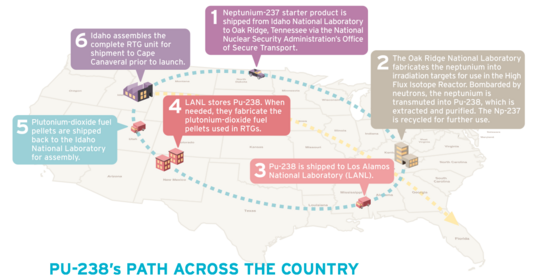 This graphic traces the circular journey of the Neptunium-237 starter product to the complete Radioisotope Thermoelectric Generator (RTG) containing Plutonium-238 fuel. Click here to continue reading this article. You must be logged in and a member of the Planetary Society. If you are not a member of the Planetary Society, you can join instantly here. If you are a member and have problems accessing the article please contact us at [email protected]. 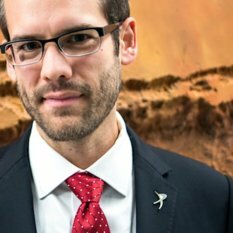 Great article AND visit with PlanRad. It is yet another example of the type of work that gets done behind the scenes at The Planetary Society to make sure that actual space launches happen. http://www.youtube.com/watch?v=tdusXIvyLFQ ...is a Google Tech Talk about how Pu-238 can be created from U-233 using the Liquid Fluoride Thorium Reactor while also producing electricity.